Some have estimated that one in 20 gamers are colorblind. I'm one of them. 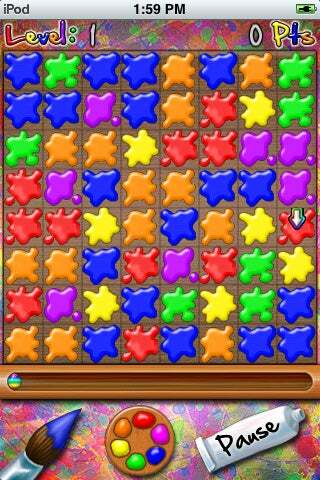 Dapple was brought to my attention last week as a game specifically designed to include colorblind players. Optimizing for a 5 percent minority is not a step many would think to take. Especially when the game is a matching puzzle based on the colors you get from mixing three paints with five other shades. Given that, can Dapple still pose a full-spectrum challenge to color-sighted gamers, without condescending to the colorblind? Both modes: I played Dapple in its color-sighted mode for nearly two hours before I discovered its colorblind mode - that's how intuitive the primary design is. Each color is also a distinctive shape, so, even though I literally could not see the difference between the yellow and green hues, or blue and purple, I still picked up what mixtures my brush could produce. And that's without mentioning the colorblind mode, which can also be a huge assist to the color sighted. In colorblind, the dabs turn into circles divided into thirds, showing either a base color (red, yellow or blue filling in one wedge) or a combination color filling in two (orange, green, purple). This mode can help all players understand the colors' relationships to one another, without referring back to the mixing guide all the time. Varied gameplay: Dapple goes out of its way to find the point where something is a challenge to you but not frustrating. There are four difficulty levels, plus a timed or untimed mode. I took untimed mode on medium to well over a million; conversely, the timed modes on hardest difficulties will take you to higher levels faster - letting you set and beat records repeatedly. If you want, hints will pop up - but only after a delay, and they may not be the best move. Presentation: Not only is this a visually appealing game, it sounds great too. The pow, splat-splat-splat of a good chain reaction is immensely gratifying. So is the soundtrack, written especially for the game, lengthy enough to keep it from getting stuck in your head, and soothing enough that it's OK if it does. (You can also listen to your own tunes). Dapple quickly became my favorite timekiller on the iPhone. My only quibbles were that it wasn't obvious or predictable why your paintbrush would change (or not change) colors. And picking up bonuses for knocking out six or eight paint spots seemed to be more luck than strategy. The game still sings despite this. Being colorblind, I never gave any thought to what colors formed others. Where Dapple really impressed me was how much I perceived my own learning and intuition in adapting to the challenge. That's just excellent puzzle-making, whatever the medium or its players. Dapple, for the iPhone and iPod Touch, was developed and published by Streaming Colour Studios. Available from iTunes store for $4.99. Played on iPhone on all difficulties, timed and untimed, regular and colorblind modes.